Since arriving at Denison 2009, Professor Kennedy has taught a wide range of courses on the ancient world including both Greek and Latin language courses from the beginning to advanced levels as well as courses in Greek and Roman history, Greek tragedy, Greek and Roman art, women and gender, and race/ethnicity in the classical world. Professor Kennedy enjoys teaching courses that allow her to bring her research into the classroom. She is also currently experimenting with role playing pedagogies. 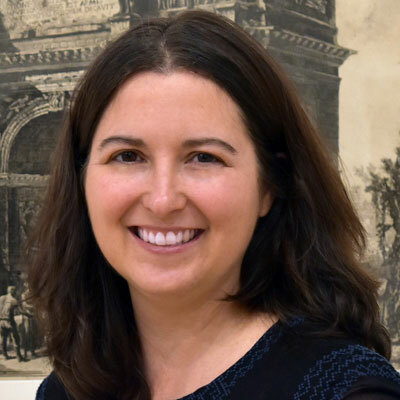 Professor Kennedy’s research interests include the intellectual, political, and social history of Classical Athens, Athenian tragedy, and identity formation (both gender/sexuality and race/ethnicity) and immigration in the ancient world. She is the author most recently of “Immigrant Women in Athens: Gender, Ethnicity, and Citizenship in the Classical City” (Routledge, 2014) and editor of the “Handbook to Identity and the Environment in the Classical and Medieval Worlds” (with M. Jones-Lewis; Routledge, 2015). She is a translator and editor (with S. Roy and M. Goldman) of “Race and Ethnicity in the Classical World: An Anthology of Primary Sources” (Hackett, 2013) and editor of the “The Companion to the Reception of Aeschylus” (Brill 2017). She is currently writing a book on race and ethnicity in antiquity and its entanglements in modern white supremacy and is co-translating a sourcebook of ancient texts on women in ancient Greece and Rome. A two-week sojourn in Rome with a Classics professor brings ancient history to life. Antiquity provides us with quite a few approaches to how to think about race and ethnicity. Students spend two weeks in Rome, studying ancient art and archaeology. Associate Professor Rebecca Kennedy speaks out on the place of Classics as the foundation of modern culture. Role-playing students transformed life in ancient Greece into a daily drama. Professor Kennedy's teaching and research interests cover the history and culture of ancient Greece, especially issues of ethnicity and citizenship.